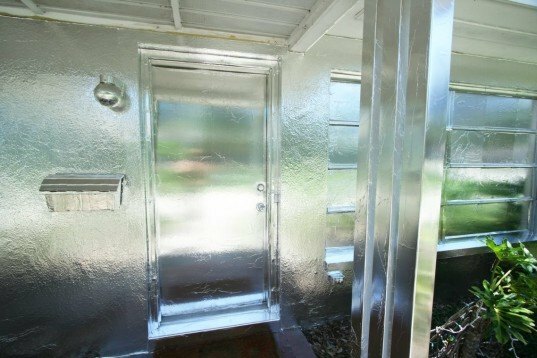 Why did this Florida man cover his entire house with aluminum foil? 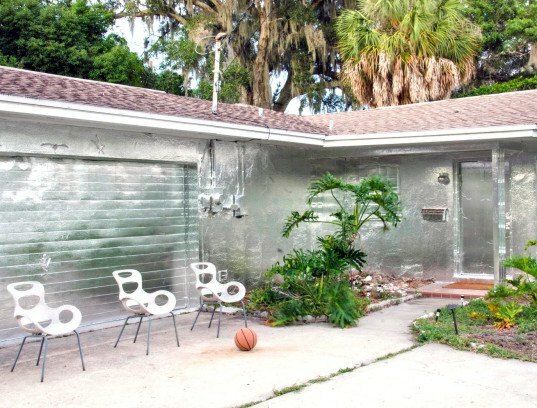 In hot regions like Florida, it’s not uncommon to see a window or two covered by aluminum foil. It’s often used to block out the blazing sun and keep a bedroom cool during the scorching summertime. For Piotr Janowski, of Tarpon Springs, Florida, aluminum foil is much more than a functional tool; it’s his chosen medium of artistic expression. 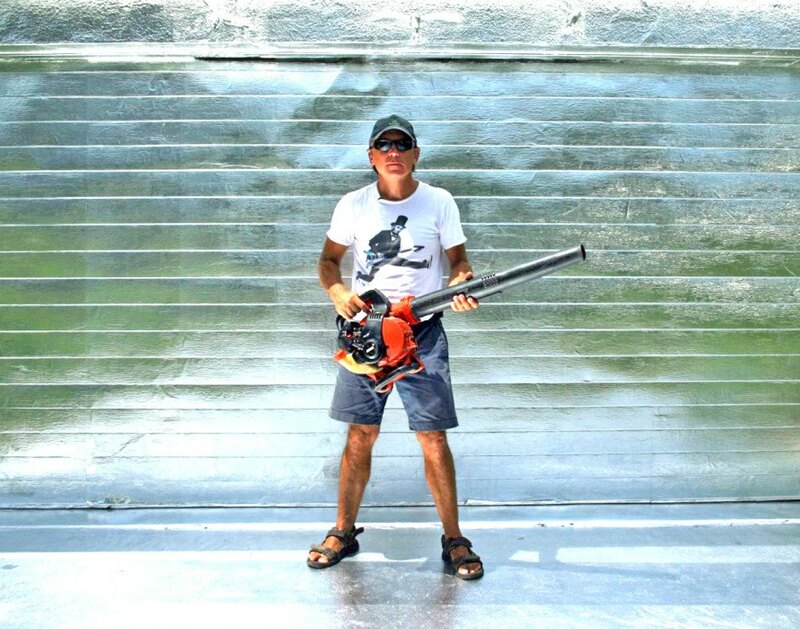 The Polish-born artist has used spray-on adhesive to wallpaper the outside of his house - every last inch - and some of the streets with aluminum foil. Just last weekend, Janowski unveiled the completed foil-covered “runway,” which is the term he uses to describe the long driveway. The concrete drive was meticulously covered with foil, with the exceptions of the cracks where common weeds are growing. Janowski left those exposed. As for the house, there are no exterior surfaces excepted from the foil wallpaper treatment. The house numbers are foiled. The front door is foiled. Even the utility boxes have been carefully and completely wrapped in the shiny encasement. Some of Janowski’s neighbors are reportedly upset about the foil fiasco, the Tampa Bay Times reports, while others are just dumb-founded. “To each his own,” said one neighbor. Although Janowski’s neighbors may be taken aback by his foil masterpiece, the local wildlife seems to be getting along just fine, as evidenced by this family of red-bellied woodpeckers who seem to be flourishing in one of the foil-covered trees. Curiously, Janowski doesn’t own the house he’s working on. It’s a rental, which he moved into in December after moving from Vienna. His landlord and city officials are aware of the foil project, but everyone is baffled about what, if anything, to do about it, as it doesn’t appear to violate any laws or ordinances. He says the foil will come down in about a month, and he’s looking into doing similar projects with museums, if anyone will have him. He first started foiling algebraic equations. Now, he foils the world! Indeed, Janowski says his art project is intended to help people think in uncommon ways about common goods. "Curious onlookers rarely identified the installation as art," Janowski said in a statement to ABC. "It was almost always assumed to have a practical value, such as a new form of insulation, pest control, or fire retardant. The act of covering the facade of a house (along with the palm trees and sculpture installation) introduced something uncommon and unexpected into the neighborhood environment, and hopefully offered a new perspective on what had been commonplace." Just this weekend, Janowski unveiled the completed foil-covered “runway,” which is the term he uses to describe the long driveway. The concrete drive was meticulously covered with foil, with the exceptions of the cracks where common weeds are growing. Janowski left those exposed. As for the house, there are no exterior surfaces excepted from the foil wallpaper treatment. The house numbers are foiled. The front door is foiled. Even the utility boxes have been carefully and completely wrapped in the shiny encasement. Two foil-covered chairs disappear against the backdrop of the foiled garage door. Janowski’s art project isn’t confined to the house and driveway, though. It extends into the yard, where he has covered several trees completely with foil. This appears to be a palm tree entirely encased in foil. Some of Janowski’s neighbors are reportedly upset about the foil fiasco, the Tampa Bay Times reports, while others are just dumb-founded. “To each his own,” said one neighbor. 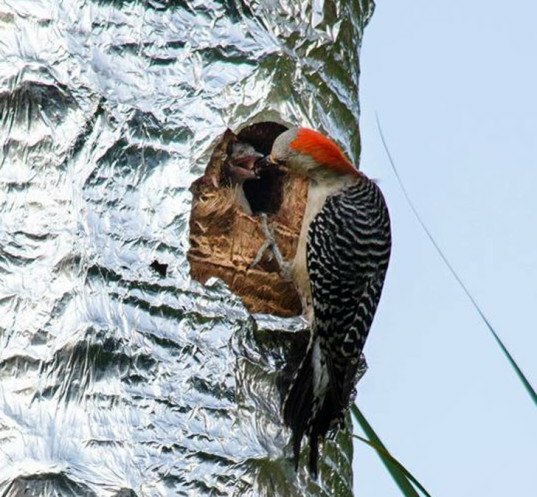 Although Janowski’s neighbors may be taken aback by his foil masterpiece, the local wildlife seems to be getting along just fine, as evidenced by this family of red-bellied woodpeckers who seem to be flourishing in one of the foil-covered trees. Curiously, Janowski doesn’t own the house he’s working on. It’s a rental, which he moved into in December after moving from Vienna. His landlord and city officials are aware of the foil project, but everyone is baffled about what, if anything, to do about it, as it doesn’t appear to violate any laws or ordinances. He says the foil will come down in about a month, and he's looking into doing similar projects with museums, if anyone will have him.